"This salad is great for summer meals - especially barbeques!" 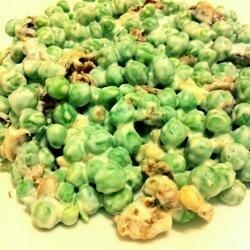 In a medium bowl, combine peas, celery, scallions and sour cream. Toss gently to mix. Just before serving, stir in cashews and bacon into salad. Season with salt and pepper. This tasty salad is perfect for potlucks and buffets. I really liked the cruncy difference but I changed it just a bit; I added half sour cream and half Ranch Dressing and it gave it a better taste. This was a big hit at a party I had. I also added the 1/2 package of Ranch Dressing for seasoning. I would definitely make again! This was very good. I also added half a pkg of ranch dressing mix to the sour cream. Also added cheese. Thanks! Had a picnic to go to that I needed to make a quick side dish to take. This salad was ready in 15 minutes and I got lots of raves about it.